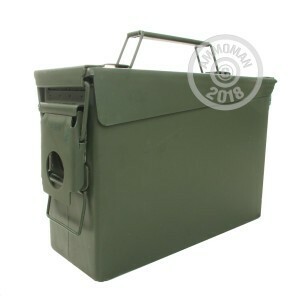 Whether you are looking for a great, safe way to store your ammunition or just love military specification (mil spec) cases, this ammo can is just what you need. Tough, safe, efficient, and portable, you can put all your 30 caliber ammo into this brand new, green, M19, mil spec ammo can. Whatever your purpose may be, this ammo can has got you covered. I have been buying and using ammo cans for years. Since Blackhawk has started having the manufacturer sell direct to them the prices went crazy. These cans sell close to wholesale for skid loads. Never had a problem from AMMOMAN with anything. The shipping actually surprised me. These cans are a must have. Note: 30 cal full cans are easier and liter to carry than 50 cal and 556.